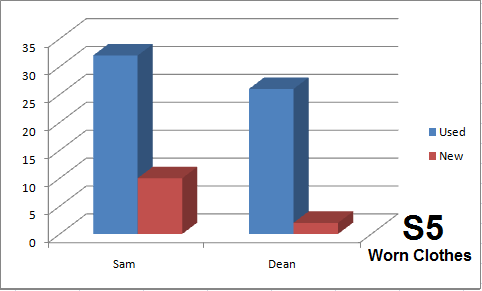 How you can do this detailed observations while watching Sam and Dean is way beyond me! But It's very cool you do and that you share! But... where is the Green Military Coat of DOOM? It's too late and my brain is not braining properly. Does that mean you only post clothing that appears in multiple seasons and I've just never noticed this rule before? I post ALL clothing - even if it just appeared in one episode. But I'm working through the seasons - so right now, I only have all clothing INTRODUCED in S1, and a few from S2, on the internet. So, right now, if Sam and Dean didn't wear it in S1 (or the first two episodes of S2) it's not up - it will be eventually though. I've got it in my files, just not on the internet. If you really wanted to see it though, I could post it early. I can do requests like that. Ahh. That makes sense. Thanks for explaining it to me. And stick to your method; I don't want to mess you up! I know how something small like that can throw off processes. Thanks for doing this, though. It's really neat to see the way it tracks. It's tempting to deviate from the method sometimes - especially when I've got such awesome screen caps of some of the clothes...like I Wuv Hugz. :) But I'll eventually get them all up! I had a question - I was looking for the shirt Sam wore in "Dark Side of the Moon," the one with snaps or buttons across the front, so it looks like he's wearing a Templar cross. Do you have an entry for that one? I'm pretty sure he wore it before, as well. Was it Sam's Chocolate Western Corduroy Shirt? This was fantastic - thanks for sharing. I say this as a someone who spent her 6 weeks travelling around New Zealand rewatching all 5 seasons on my small notebook (as it was then) cataloguing the clothes and being very frustrated because the smallness of the screen didn't always allow me to distinguish colour or type enough to do a good job and I kept finding myself distracted by all the pretty (and the plot, I suppose). So way to go - this is brilliant! 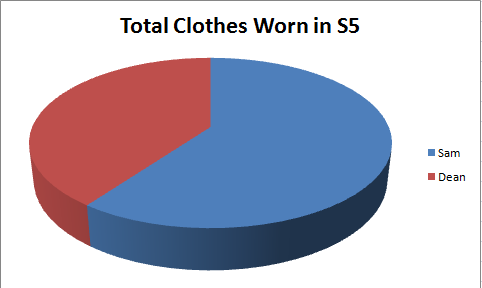 Interesting to note - that as the seasons progress Dean has a higher percentage of clothes, but that he is buying less and less new ones - he is obviously very thrifty. 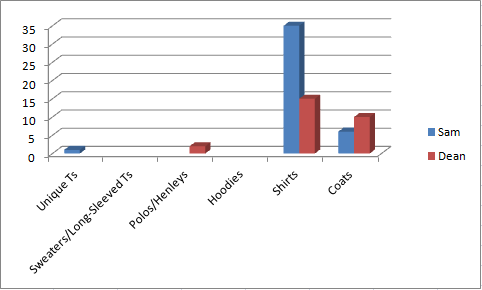 He also continues to not only have less clothes but a restricted amount of different types.How wonderful are charts? I believe there is a U-Haul behind the Impala which is doctored out during editing. No way can those boys be carrying around all those clothes. And finally - I guess that Deans clothes were kept after he went to hell. It has occured to me that they must have kept Sammy's too because there have been old faves returning. And yes, I love the fact that Dean is so thrifty (Sam to a lesser extent), because it really makes sense for the character...even though I also think that they really need that U-Haul trailer. Mind you, someone else suggested that they might keep storage lockers like their dad, and just rotate their wardrobe that way...haha. I think it makes sense for Sam to have kept Dean clothes when he went to hell, mainly because Sam was so determined to bring Dean back...but you are also right that they kept Sam's clothes too. 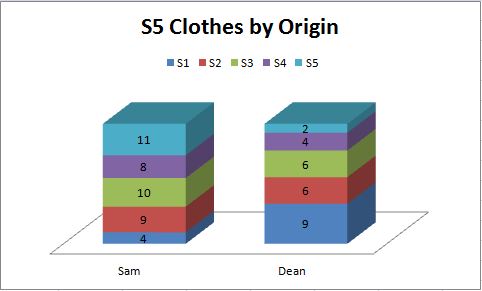 I haven't done S6 yet, so I don't know the percentages, but although Sam had a lot of new shirts in the beginning, more and more old favourites are reappearing...so, I figure Dean must have left a duffle or two of Sam's at Bobby's before he went off to live with Lisa. This is fantastic! Congratulations on your fine accomplishment! Do you show when clothing is "retired" -- such as the last appearance of the stolen leather jacket? No, and I'll tell you why...if you go to the shirts list, and you click on "Dean's S1 Beige Shirt", you'll be surprised to discover that it appears in S1 and S4! I thought for sure that it was gone when it didn't show up in S2 or S3, but it wasn't...so, until the show itself is over forever, there is no way for me to predict what may be "retired" and what may just be packed in a duffle somewhere waiting to be used again 3 seasons later. So, the most I can do is state when someone has received so much damage that it is unlikely to return. As for the leather jacket - it's last appearance (I'm pretty sure) is in 6x01, which I haven't capped yet (have to wait until the DVDs, because I like making my own logo-free caps). So, I'll add that information in once I catalogue S6...in the meantime, a part of me holds out hope that the wardrobe department will somehow get a replacement and the jacket won't be retired after all. This is what I think too...and I base this on the fact that I KNOW guys, (both my brother, and my best friend happen to be male). And my best friend in particular pretty much only wears generic t-shirts that he can by in packs of 3-5 for cheap. It's why I didn't bother recording the beige/white/black/grey t-shirts that Sam and Dean wear. ---Do you ever notice anything stained, torn, or mended? I loved the wardrobe choices in 6.1 -- especially the cookout scene, when he is in a buttoned shirt with NO LAYER, and the checking the house scene, when he is padding about in his sock feet. D: Wardrobe is SO MEANINGFUL on this show. Criminey! It WOULD be awesome if they had a mending day. I kind of also wish that we WOULD see stitches in their clothes - but that's me. I'm also loving the wardrobe choices in S6 - because in S1 Sam had a lot of unique T-shirts too, and to me that signified how he hadn't been Hunting. So, it's the same with Dean in S6, it's evidence that he was "domestic" for a year. Like you said, wardrobe is so MEANINGFUL on the show...like for instance, from what I've seen of S6, Soulless Sam wore a lot of new clothes, but once Sam got his soul back, clothes from as far back as S1 started reappearing. just created an account. Needless to say, great fan. Have a problen, to which I seek help. Couldn't find from the interwebz. In the episode "Dead Men Don't Wear Plaid" Jody Milles uses a very cool utility jacket. Right in the end, after Bobby has killed his wife for the second time. Just can't find the information of the jacket anywhere. Maybe here someone could give me some assistance.